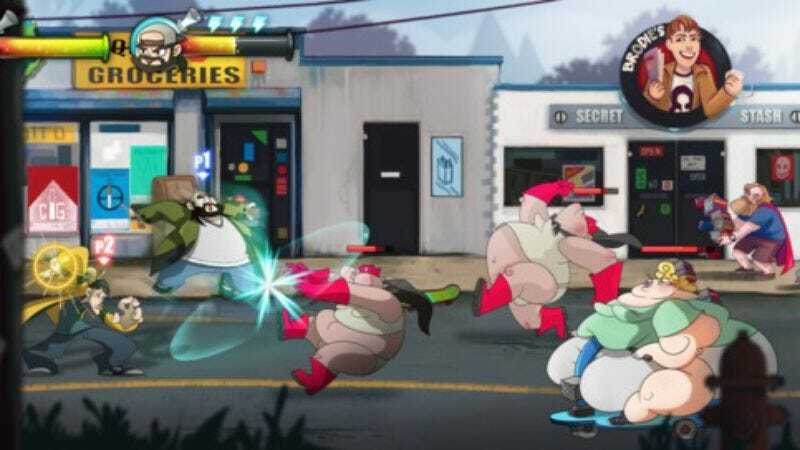 The developers over at Interabang Entertainment have launched a Fig crowdfunding campaign to raise $400,000 for a new Jay and Silent Bob video game, appropriately named Jay And Silent Bob: Chronic Blunt Punch. It’s a side-scrolling beat-’em-up in the vein of the arcade version of X-Men or Streets of Rage. You play Jay or Silent Bob, teaming to beat up a bunch of bad dudes in order to save their pot customers who are trapped in, you guessed it, a mall. Jason Mewes and Kevin Smith will provide voiceover talent and serve as creative consultants for the pre-production process. It’s not all a whirling dervish of fists and roundhouse kicks; part of the combat system involves a barrage of insults and flattery in order to avoid boss battles altogether. You can play single player, but if you play with two, you can execute some devastating tag-team attacks inspired by games like God Hand and Marvel Vs. Capcom. The blunt smoking and healthy doses of creative cursing won’t be watered down, either. Interabang Entertainment is aiming to keep the spirit of the characters alive without any censoring or compromises. If the game reaches its funding goal, the game will be released in early 2018 on Xbox One, Playstation 4, and PC.